NC State Senior Design project studied the design and construction of the wildland fire shelter. Wildland fires burned more than 10 million U.S. acres in 2015. These fires can be dangerously volatile, sometimes trapping firefighters among the flames, so since 1977, firefighters in the field have been required to carry emergency fire shelters with them at all times. These last resort shelters have saved many lives, but their performance can always be improved. One group of students at Raleigh, N.C.-based North Carolina State University’s (NC State’s) College of Textiles recently made it their mission to improve the seaming of the shelter to provide better protection. Through a yearlong capstone course, seniors majoring in both Textile Engineering and Textile Technology have the opportunity to participate in real-life product development for companies and organizations to solve real-world problems or achieve existing goals. Students Cody Brown, Katavia Teachey, and Nathan Wintermute spent their 2016-2017 academic year working on a project sponsored by the Textile Protection and Comfort Center (T-PACC) to augment the design and construction of the wildland fire shelter to improve the safety of wildland firefighters. They were awarded a NC Space Grant to support their senior design project. As part of a larger project, T-PACC is conducting research to develop better fire-blocking materials for wildland fire shelters. 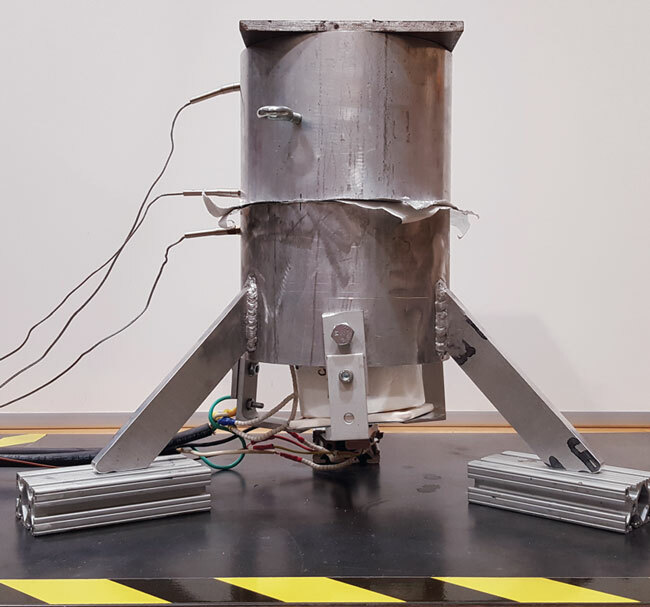 It tested the prototype fireshelters in a unique shelter testing chamber over the past several years, and found that a recurring issue is the tendency of seams to fail before the body of the shelter. In fact, video taken during this testing shows the flames entering the shelter at lines that match the seam locations (See Figure 1). If these seams can be improved to last longer, then the overall duration of shelter protection can be improved. A primary goal of the project was to empirically prove that the seam of the shelter has a significant effect on the overall heat transfer. The students began the process by thoroughly researching the existing fire shelter, including history and development. The standard fire shelter was under constant redesign to improve its functionality; many different shapes were attempted until 2002, when the current capsular design — roughly the appearance and shape of a foil-wrapped baked potato — was selected. The group used the “U.S. Department of Agriculture Forest Service Specification: Shelter, Fire, M-2002 (5100-606C)” as a guide to understand which design choices were made and why. Based on this standard and direction from T-PACC, the team attempted to improve the shelter with as little change as possible to the component materials, in order to prevent any substitutions or additions from releasing toxic fumes when burned, and also to ensure the results of testing would be directly related to the change of the seam rather than a change in material. The team focused its research on joining methods. The standard shelter uses sewing as its primary means of joining. Sewing, by its nature, pierces a piece of fabric to pass the thread through, and the team wanted to find methods of joining that would eliminate these punctures from contributing to the heat transfer. Unfortunately, it was quickly determined that typical alternatives to sewing, including thermal bonding, ultrasonic bonding and adhesives, do not perform well at wildfire temperatures, which may reach as high as 1800°C. Concept selection was narrowed down to a seam redesign that changed the pattern of folds within the seam, but did not change the material. Prototyping centered on the fabrication of four seams, identified for their theoretical low heat transfer and compatibility with the two-layer system. The team produced small scale sample sizes, rather than full shelters, to allow bench scale testing and conservation of materials. They used an industrial sewing machine to construct the seams in order to easily adjust the needle size, stitch density, loop size and tension, and designed prototypes to be tested for one of three variables: tensile strength; radiant heat exposure; or convective heat exposure. 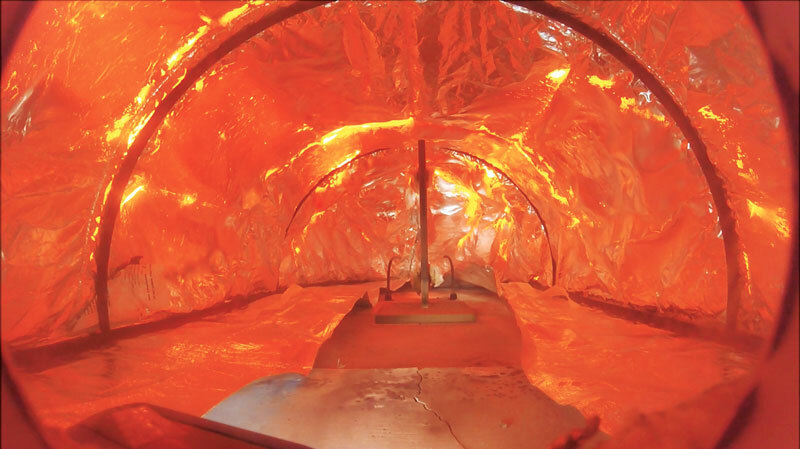 After the production of small seam samples, the team constructed 25-percent scale model fire shelters and finally a full-scale fire shelter incorporating a redesigned seam (See Figure 2). They used the highest performing prototype to sew the three body-arc seams of the shelter’s dome area, which forms the majority of the shelter’s body, and used a quadruple stitch pass to fasten the cross lapped design that joins the material. During the process, the team used several methods of analysis based on shelter performance. Due to ease of access, tensile strength was tested first, then radiant heat exposure testing using a team-designed apparatus (See Figure 3) to isolate a seam’s heat transfer. Finally, a flame was used to conduct convective heat exposure to confirm and expand upon the radiant testing results. 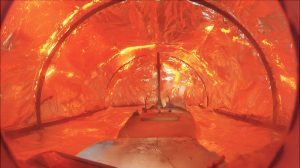 Testing showed that a seam redesign could provide at least 10 percent convective heat transfer reduction across the seam region; radiant testing of the original shelter seam showed visible scorching and degradation of the material occurred at around 370°C. The redesign did add around 0.25 pounds, but it markedly increased tensile strength, with the highest performing prototype passing the original shelter’s strength by approximately 55 percent. The team was successful in developing and implementing a new seam design for the wildland fire shelter and testing it using a personalized method of seam region isolation. The test results show that this seam redesign significantly reduces heat transfer into a fire shelter, potentially saving wildland firefighter’s lives. Editor’s Notes: Nathan Wintermute graduated from NC State Spring 2017 with a B.S. in Textile Engineering. For more information on this project, please contact the T-PACC sponsor Dr. Roger Barker, rbarker@ncsu.edu; and John Morton-Aslanis, jmorton@ncsu.edu. For more information on the NC State Senior Design Capstone Program, please contact the program directors: Russell E. Gorga, regorga@ncsu.edu; and Jesse S. Jur, jsjur@ncsu.edu.